Built in 1885-1886 on Jernbanegade, in the center of Copenhagen, Denmark, the Cirkusbygningen, (Circus building) was designed by the architect Henrik Vilhelm Brinkopff (1823-1900). It was inaugurated on May 8, 1886 by the German "circus king," Ernst Jakob Renz (1814 -1892). At the time, circus tents were not so common; circus companies that traveled all around Europe played mostly in simple circus constructions made of wood—or, in major cities, in permanent circuses built in stone. Ernst Renz, a remarkable equestrian and director who had made a fortune in the circus business, had erected elegant and luxurious circus buildings of brick and stone in cities such as Berlin, Vienna, Hamburg, and Breslau. The original plans of the Copenhagen building called for an elaborate façade, replete with statues and Greek colonnades, but on its opening in May 1886, the façade had become somewhat simpler, although still elegant and ornate. Just below the roof, on the periphery of the outer wall, was (and still is) a beautiful frieze by the sculptor Frederik Hammeleff (1847-1916), with horseracing motifs evoking ancient Rome and Greece. For once, Renz was just the tenant of the Cirkusbygningen, for which he had signed a three-year lease with its owners. Even so, he sub-rented the building in 1887 to his German colleague, Albert Schumann (the elder, 1858-1939), who had left the family circus founded by his father, Gotthold Schumann (1825-1908), and had already opened a circus in Malmö, Sweden, in 1885. But Ernst Renz, whose circus empire was already dwindling, didn’t renew his lease after the 1888 season. 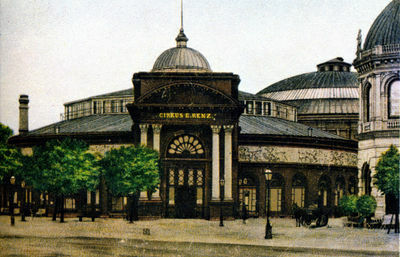 The Cirkusbygningen would be subsequently rented to visiting foreign circus companies, such as those of the German Paul Busch (1850-1927) from 1889 to 1991, and again in 1895; the Polish circus of the Russian director of Italian descent Aleksandr Ciniselli (1861-1933) in 1909, 1910, and 1912; the circus of the Russian (recently established in Western Europe) Mathias Beketov (1867-1928), from 1902 to 1904, and in 1913; the Swedish Orlando in 1905, 1907, and 1908; and the Dutch Carré in 1911. The circus of Gotthold Schumann, Albert Schumann’s father, was the tenant in 1892 and 1893. In March 1914, most of the Cirkusbygningen burned down. Only the outer walls, with their frieze, and the façade remained standing. The circus was quickly rebuilt, this time with its roof and inner walls made of concrete. It reopened in 1915 with the German Zirkus Sarrasani as tenant. The Cirkus Schumann of Willy, Ernst, and Oscar Schumann, the nephews of Albert Schumann and grandsons of Gotthold, came for the first time at the Cirkusbygningen in 1916. By then, the family had been performing in Copenhagen at a time or another since 1887. Willy, Ernst and Oscar Schumann had begun to perform in Scandinavia with their grandfather Gotthold in the 1880s. In 1887, they and their father Max had become Swedish citizens. Max had succeeded Gotthold at the helm of the circus in 1897, and in 1915, the circus had passed into the hands of his sons. The Schumann brothers returned to the Cirkusbygningen in 1918. They remained there until 1937 and, after a four-year break at the beginning of World War II, returned in 1943 to occupy the building in the summer until 1968. During this long period, the circus of Copenhagen would be known as Cirkus Schumann—and it would be viewed as one of Europe’s most prestigious circuses. In July 1954, Oscar Schumann’s sons, Albert and Max took charge of Cirkus Schumann. With them, and their outstanding equestrian presentations, Circus Schumann, whether in Copenhagen or elsewhere, reached the apogee of its fame. During the Schumanns's absence, between 1938 and 1942, the Cirkusbygningen hosted other circuses including the Franco-Swedish Houcke, the Danish Miehe, and the Dutch Mikkenie-Strassburger. The Cirkusbygningen didn’t give any performances in the winter: An old local rule (which applied only to Copenhagen and dated back roughly to 1910) banned winter circus performances. The provision had been introduced under pressure from the city's theater owners, who resented any competition from circuses, which were at the time very popular. In the winter, the Cirkusbygningen was used as a movie theater, known as the World Cinema. In 1963, a supermarket chain, Anva, bought the Cirkusbygningen. They had plans to tear it down and build in its place a modern and elegant department store, which would compete with the well-established chains Illum and Magasin. But the project met with a wave of protestation, and since Anva lacked the necessary capital for the construction(French) A temporary circus building, originally made of wood and canvas, and later, of steel elements supporting a canvas top and wooden wall. Also known as a "semi-construction. ", the plans were abandoned. Yet, uncertainty about the building’s future and escalating rental price led the Schumanns to end their summer seasons at the Cirkusbygningen in 1969. From 1970 to 1990, it was the Benneweis family, with Eli Benneweis and his daughter Diana, as well as Nelly Jane Benneweis, Henrik Krogsgaard and Claus Jespersen, who took over the Cirkusbygningen's summer season. The circus building became known during that period as Cirkus Benneweis. In 1974, the City of Copenhagen acquired the endangered building and rented it out to the Benneweis family, who in addition to their summer circus activities became responsible for the World Cinema management in the winter. In 1983, the municipality gave joint management of the Cirkusbygningen to Benneweis and Tivoli. In 1988, the building became a protected landmark. But times were changing, even for a summer circus in a city like Copenhagen. After more than one hundred years, audiences were looking for other forms of entertainment: In 1990, Eli Benneweis decided to quit before the situation could get worse. Ever since, the Cirkusbygningen has been used for such events as musicals, ballet, music festivals, concerts, etc. In 1996, when Copenhagen was designated as the European Culture City, the German Circus Roncalli played in the old circus building for a few days in December. In 2003, the Cirkusbygningen was leased to the Scandinavian entertainment company Wallmans Nöjen, which uses it for a dinner show. They do not intend to host any circus in the foreseeable future. The café in the building's foyer is decorated with posters, photos, and programs of some of the circuses and circus artists who have graced its ring for over a century. Originally published by circus-dk.dk. Translated for Circopedia by kind permission of the author.